This work examines theoretical issues, as well as practical developments in statistical inference related to econometric models and analysis. This work offers discussions on such areas as the function of statistics in aggregation, income inequality, poverty, health, spatial econometrics, panel and survey data, bootstrapping and time series. ". . .cover(s) a nice selection of topics." 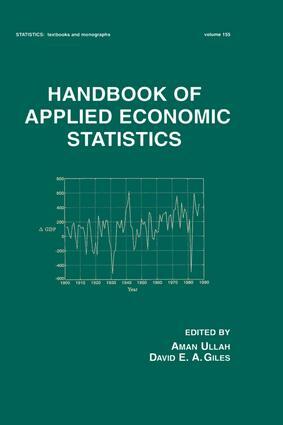 Economic statistics and social welfare comparisons - a review; measurement of inequality; poor areas; the demand for health services in a developing country - the role of prices, service quality and reporting of illnesses; on mobility; aggregation and econometric analysis of demand and supply; spatial dependence in linear regression models with an introduction to spatial econometrics; panel data methods; econometric analysis in complex surveys; information recovery in simultaneous equations' statistical models; diagnostic testing in econometrics - variable addition, RESET and Fourier approximations; applications of the bootstrap in econometrics and economic statistics; detection of unusual observations in regression and multivariate data; union-intersection and sample-split methods in econometrics with applications to MA and SURE models; modelling economic relationships with smooth transition regressions; modelling seasonality in economic time series; nonparametric and semiparametric econometrics of panel data; on calibration.